Could A Truth Commission Have Saved The Star Wars Universe From Another Conflict? A brutal regime is at last brought to its knees, its key leaders start fighting among themselves, and the old tyrant is killed without trial. Libya in 2011? No: the world of Star Wars at the close of Return of the Jedi. The latest film, Star Wars: The Force Awakens was released last week (in case you hadn’t noticed). It is set in precisely the sort of conflicted environment that we see when contemporary totalitarian regimes collapse, be it the former Soviet Union, Afghanistan, Iraq, Libya or Egypt. In the new film, our rebel heroes find themselves pitched against the “First Order” – the military rump of the former Galactic Empire. This suggests that after the fall of Emperor Palpatine the Rebel Alliance engaged in very poor post-conflict planning, and engaged only minimally with the mechanisms of transitional justice. Given the destruction that ensues, it’s a great shame. Drawing upon contemporary academic, legal, and policy perspectives, this brief contribution will outline (without spoilers!) some of the possibilities that were open to the Rebels, and the galaxy at large, to move on from the Empire and to deal with the legacy of totalitarianism. The original ending of Return of the Jedi showed the Rebels on Endor celebrating the destruction of the second Death Star. The 1997 Special Edition somewhat incongruously inserted CGI footage of celebrations right across the galaxy. On purely cinematic grounds, this struck me as an odd move at the time – but it was politically strange, too. Surely, there must have been at least some people who liked the Empire? Maybe they got the space trains running on time, or something. 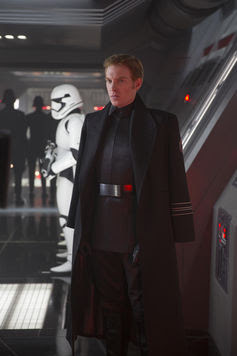 In the new film, we see that First Order Stormtroopers are “raised to do one thing”. That “one thing” is not gardening. The bad guys seem to have been “brainwashed” against the plucky Resistance, and probably believe that the Jedis are religious extremists who murdered their benevolent leader. This is precisely the sort of defiant myth-making that can be seen in many “defeated” armies or groups in post-conflict societies (nationalists in Serbia, for example, or some of white South Africa). Some kind of truth-telling process might have helped to prevent the perpetuation of dangerous myths, and helped to bring closure on both sides. It might have exposed the scale of horrors to those who never experienced them, and who would prefer not to think about them. In Episode I, The Phantom Menace, which was released after Return of the Jedi, the Galactic Republic essentially voted for its own demise. It was therefore by no means clear that its structures should have been immediately restored when the Empire that replaced it was defeated. To endure, the successor to the Republic would have needed a robust constitution. Much the same problem faced post-WWII Germany, which could hardly have re-embraced the fatally weak construction of the Weimar Republic. In response, the new German Basic Law (in effect, the constitution) is built upon the idea of “self-defending” or “militant” democracy, which prevents non-democratic parties from seizing power even by democratic means (as the Nazis did). It is also crucial that genocide, war crimes and crimes against humanity – committed by whichever side – are thoroughly investigated. It’s fairly clear that the Empire committed a grievous crime against humanity when it destroyed the planet of Alderaan (although whether the conditions for genocide would have been met is a surprisingly difficult question: see my earlier, more serious, contribution on this point). More controversially, I’ve always wondered what happened to the prisoners of war that Han and Leia seemed to capture outside the shield generator on Endor: despite the efforts of George Lucas to re-write history, we know that Han can be a little trigger-happy. Criminal justice can be divisive, and may open old wounds. Fragile or emerging states may be reluctant to prosecute “war heroes”, as we can see with the difficulties surrounding the eventual establishment of a new tribunal to hear allegations of criminality by members of the Kosovo Liberation Army by Kosovo today. Nevertheless, the idea that there is a conflict between truth and justice has largely been rejected both in theory and practice. It is, instead, more a question of timing: maybe aim for some form of truth commission first, followed later by the trials of those suspected of the most serious crimes – in fact, prosecutions were meant to follow even the South African Truth and Reconciliation Commission, but that process did not play out as intended. And then there’s one of the most serious problems facing post-conflict societies: how to maintain the rule of law when most of the security sector and justice sector is tainted by complicity in enforcing the previous regime. A new generation of police, lawyers, and judges may be needed, as will radical reform of the military. But done badly, it is easy for this to become a politically-motivated purge. Even outside the security and justice sectors, it may feel important to exclude collaborators from holding certain public positions. Right across the former Soviet sphere of influence there have been “lustration” processes, where people are compelled to say whether they were collaborators. If they were, then they may face restrictions on public sector employment. Lying is usually a criminal offence, so if a lustration statement is later shown to be false, punishment will follow. This might be difficult for Garindan, the elephantine-nosed civilian alien seen briefly in Episode IV: A New Hope, who leads a battalion of Stormtroopers to the Millennium Falcon in Docking Bay 94 on Tatooine. 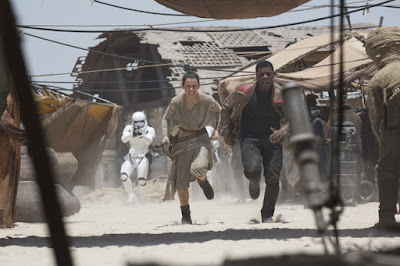 The Force Awakens is a remarkable achievement from pretty much any perspective. It is part of an emerging cinematic trend of filmmakers rethinking the casual destruction seen in many blockbusters: the upcoming Batman Vs. Superman film deals with a backlash against Superman’s accidental destruction of much of Metropolis in his fight with General Zod in Man of Steel, while Captain America: Civil War sees the Avengers violently split on being held to account for their inevitably destructive activities. But The Force Awakens is also a fascinating attempt to look at the pitfalls of mismanaging a post-conflict environment. And contra the 1997 additions to Return of the Jedi, the new film shows that conflict doesn’t end abruptly, and that cycles of violence may quickly be re-ignited. Should it really take a film like this to remind us of the consequences of armed conflict?